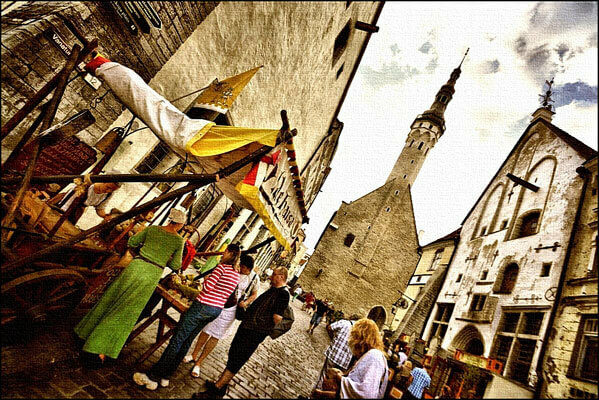 The history of Estonia is already quite rich and enchanting for such a small country. Starting from the Viking invasion and ending with the occupation by the Germans, the Swedes, and the Russians, Estonia is full of stories, legends, and tales. In the end, the country has restored its independence and today is a proud member of the EU and NATO. After the ice-age Estonian ancestors settled along the Baltic coast. Estonians are Finno-Ugrian people who are related to the Finns. They were first mentioned by a Roman writer named Tacitus. He called them the Aesti. At first, Estonia was conquered by the German crusaders who tried to Christianize the local pagans. However, they had little luck with that. Until being conquered the Estonians lived as free farmers organized under local leaders. The Germans settled in Estonia and wielded powerful influence for 700 years. Later the country was conquered by the Swedes; During those times, the Swedish King Gustav II Adolph founded the Tartu University in 1632. In 1695-97 Estonia was struck by famine, which killed many of country’s people. Several years later a plague outbreak followed and as a result thousands of people died. At the beginning of the 18th century Sweden and Russia had a war, which is historically known as the Great Northern War. In 1721, when the war ended, the Swedes gave up on Estonia. Russia have gained a so called “window to the West,” though Germans still retained local control. In 1816 serfdom was abolished in Estonia. During the 19th century the Russians tried to ‘Russify’ Estonia. Russian became the language of instruction and official business in Estonia. However the books and newspapers were still published in Estonian. People’s interest in Estonian culture and history grew and later many cultural and economic societies were established. In 1940 the Russians invaded once again and very soon Estonia has become a part of the Soviet Union. The Germans tried to invade Russia and at first they even succeeded and captured Estonia. However, the Russians invaded Estonia again and very soon the German troops had to leave the territory. The Russians forced a tyrannical regime on the local people and . collectivized farming. Estonians were doing their best and tried to fight with Russians with all their might. In order to do so they ran away to the forest and started to create special organizations like Forest Brothers. Fortunately, a few years later the events known as glasnost (openness) and perestroika (reconstruction) occurred. This was the perfect chance for Estonians to demand for independence. In 1988 Estonia was given some economic autonomy.